1. 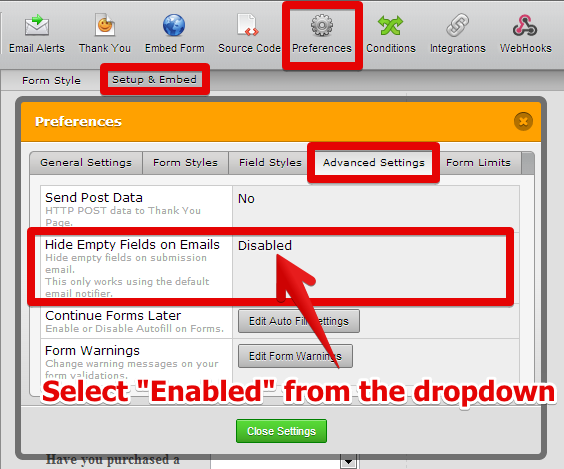 Click on "Setup & Embed"
3. Under "Advanced Settings" tab enable the "Hide Empty Fields on Emails"
FYI: This feature will work only on default email template. If you edit/modify the notification email template, this feature will not work. I want to do the same but as you point out if this Template is edited at all it then upsets the hide empty emails. Does mean even if the "Question & Answer" is removed. I would think that a lot of people would be glad of the ability to remove some of the text that means nothing to the user in a Response without making the Template "dirty". Would this feature be considered at all? Is there way to work around this? We will be replying to it shortly and would appreciate if you would leave all further responses there.